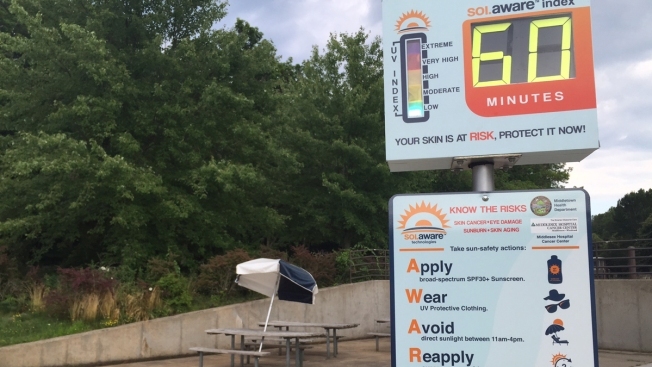 A device at Middletown’s Crystal Lake and another at the Veterans Memorial Pool measure the strength of harmful UV pays as they change throughout the day, displaying the number of minutes it could take to burn unprotected skin. Local health departments are turning to new technology this summer to help prevent sunburn. “People don’t know how dangerous is the UV exposure in real time at the point of exposure so this device help them to understand,” said Ferenc Fazekas the project lead at SOLaware Technologies, which created the devices. Middletown’s Health Department and Middlesex Hospital said displays are an effort to remind people to slather on the sunscreen frequently, and after getting out of the water. According to the manufacturer, Wallingford, North Haven and other shoreline towns are also testing them out.